What Were The Barbary Wars? The Barbary Wars were a series of conflicts that took place between 1801 and 1815 off the Barbary Coast in Northern Africa. 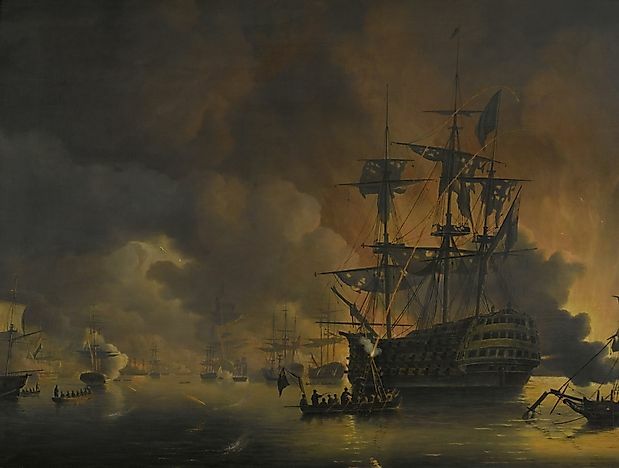 A dutch painting of the Barbary Wars, called the "Fire on the Wharves of Algiers". The Barbary wars were a series of conflicts which led to two wars fought on the shores of the Mediterranean Sea during the late 17th century and early 18th century. The wars involved Barber pirates, the United States, and Sweden during the Ottoman Empire reign and were fought over the same reason; pirates demanding trading fee from ships and ransoms for releasing captured crew men. These wars were fought more than once in cities that are presently known as Tripoli, Algiers, and present day Morocco during the Ottoman Empire rule in Africa. The Barbary wars gave the newly formed United States of America an opportunity to present itself as a strong nation capable of standing for itself defensively against its enemies. The wars created a new relationship between the United States of America and the Northern African nations. Previous treaties, like the one held with Morocco was reviewed and strengthened after these wars. Trading increased exponentially and led to the growth of the nations involved in the war. The Mediterranean Sea had for a long time been a major trade route to Europe and a greater part of Asia for American vessels. During the advent of the war, pirates in the Barber cities of Tripoli, Algiers, and Tunis would demand a levy from trade ships plying these routes. Ships that refused to pay the demanded fee were hijacked and have their goods stolen. Additionally, the pirates also captured crew men and enslaved them for a ransom. During the 1780s, just After United States of America was recognized as an independent state, the British Empire ceased to protect American ships plying the route. When the Barbary pirates learnt of this new development, they jumped to the opportunity by robbing and hijacking the ships. The pirates caused the United States of America’s navy to engage them in a series of battles in the areas where piracy was rampant in a bid to end the escalating menace. When President Thomas Jefferson learnt of the brutality of the pirates, he sent United States naval ships to the Mediterranean to cope with the situation. This was the first Barbary war and it lasted between 1801- 1805. After the war ended, the pirates retreated and allowed fair passage to the ships. It was not long before the pirates struck again and started making it difficult for the ships to ply that route. President James Madison, Jefferson's successor, directed the US military to engage the pirates in a second war which lasted until 1812. On one hand, the United States joined hands with other nations such as Sweden in order to fight the pirates in the Mediterranean. During the second war, forces were drawn from the just concluded war against the British on American soil. On the other hand, the pirates had an assembly of outlaws fetched from the Northern Africa cities of Tunis, Algiers and Tripoli. After the war against the Barbary pirates, there was a slight upsurge in piracy activities. However, the United States fought back. Back at home, there were praises by political parties from both side of the political spectrum who praised the present administration for ending the wars. They also compared the former federalist regime with the current one for not ending the war against the pirates. The US also built three frigates (USS Constitution, USS United States, and USS Constellation) to answer the call for security and also carried out military operation on the shores of Northern Africa in a bid to make interventions against the government of Libya in what is called the Third Barbary war. What Were The Great Italian Wars?